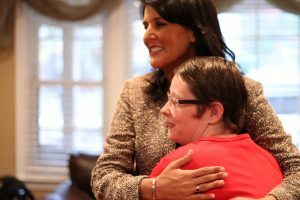 Governor Nikki Haley Visits Community Options, Inc. Home | Community Options, Inc.
Columbia, South Carolina – On Tuesday, November 5, Governor Nikki Haley visited a Community Options’ home on Beacon Hill Road in Columbia, SC. For nearly 25 years, Community Options has developed housing and employment programs for people with disabilities. Community Options opened its administrative, program and fund raising office in Columbia in 2007. 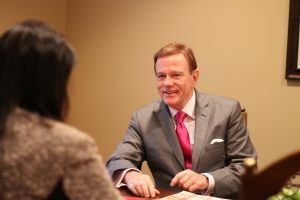 Under the management of South Carolina Executive Director, Dot Goodwin, Community Options has opened 10 small homes in the Columbia area in addition to its first home in Greenville. In 2012, Community Options opened the Beacon Hill home. Three people moved into the home from state-operated regional centers. The home was purchased with a combination of Capital funding through the Department of Disabilities and Special Needs and the Housing Trust Fund through the Housing Authority, for the purpose of moving individuals from institutional settings into community residences. 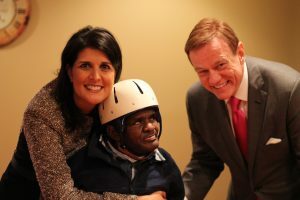 Robert Stack, Founder, President and CEO of Community Options is proud to have Governor Nikki Haley visit our residents at our Beacon Hill home. For nearly 25 years, Community Options has developed housing and employment programs for people with disabilities. Currently the 8th largest non-profit in New Jersey, Community Options operates with a budget over $96 million and serves thousands of people with disabilities through 38 offices across 8 states. Providing advocacy assistance to empower people with disabilities, Community Options believes that all people –regardless of disability level – should live and work in the community with dignity, choice, and self- determination. A registered PVO with USAID, Community Options is also the pioneer of innovative programs for people with disabilities in the Middle East, Russia, and South America. Please visit our website at www.comop.org. This entry was posted in Press Releases and tagged Nikki Haley. Bookmark the permalink.